This was a very nice tour. Ravello was a hidden treasure not over run by other tourists. The bus driver was amazing, we felt safe going around those steep curves. The tour guide was great. Really enjoyed this tour. Would recommend if you are looking for a beautiful drive up the Amalfi coast and a visit to the beautiful town of Ravello. We had the option to take a boat along the coast. So worth the time and money! Amazing day. Excellent! Salvatore, our bus driver was great. Rosella was very knowledgable, and spoke many languages, English, French, Italian keeping everyone informed and engaged! I highly recommend mend this tour. It would be difficult to see the area independently and hear/learn everything about the areas we visited. Amalfi and Ravello was another good trip we had arranged for our holiday. First stop from Sorrento was along the Amalfi Coastal towns including Positano before stopping in Amalfi. There was a choice of taking in a 45 minute boat tour of the coast or spending the extra time in Amalfi. We went on the boat tour and the coast line was spectacular and well worth the trip, after this we had a little time left in Amalfi where my wife and I went to the Cathedral which was beautiful inside. 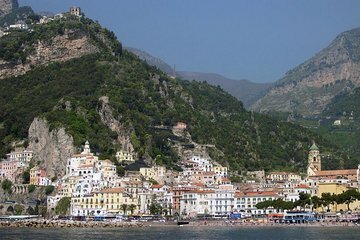 Our time in Amalfi was up so it was off to the next destination and we stopped in a small village called Scala for lunch, this looks over to Ravello and is only a 5 minute bus journey. Once we arrived in Ravello it is a quaint town with only a couple of streets of shops so not much time was given. I must say the tour guide was very good throughout and the driver was also excellent, the roads at Amalfi are very narrow with not much room for oncoming traffic.